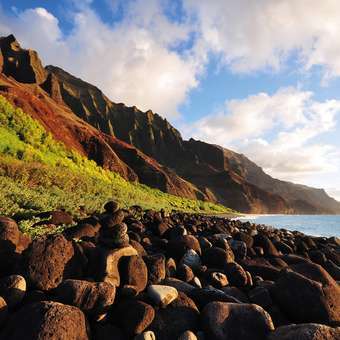 Oahu, Maui or Kauai - each of the Hawaiian islands has its own magic and is worth a visit. Only shorts flights separate the Hawaiian Islands from each other. If you have already flown half a world away, why not also visit Maui, Oahu or Kauai? Just like Big Island, each island has its very particular charm. It will be worth your while, even if you just stay 2 days per island! There are several flights daily. We highly recommend you reserve a rental car on top of the accommodation. You can either fly back to Europe from the last island visited (in which case you will have to take all your luggage with you) or fly back to Kona to begin the long way home from there and make use of our free Kona baggage service: leave suitcases and bike box with us and travel simply with a carry-on luggage from island to island... We will then bring everything to the Kona airport when you fly back to Europe! Magnificent beaches, the world-renowned Na Pali Coast and the Waimea Canyon are the landmarks of the so-called „Garden Island“! Covered in lush green vegetation, Kauai offers everything a nature lover or someone looking to recharge their batteries could ever wish for. The first King-Kong and Jurassic Park movies were filmed here! 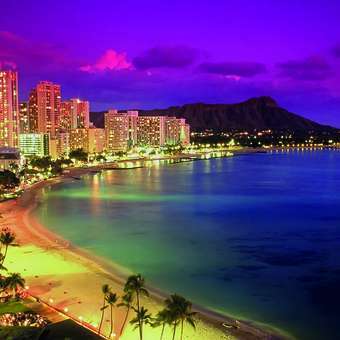 The multicultural metropolis of Honolulu and the world famous Waikiki-Beach are an invitation to sunbathing, shopping and partying. You can admire the surfers on the North Shore and Pearl Harbour will leave you with a lasting impression. Moments after takeoff you are already landing in Maui, a flight of less than 20 minutes! Feel Free – you left your luggage in storage with us in Kona – so with only cabin luggage and a new-found lightness, you head to the Alamo counter to pick up your rental car. A few minutes’ drive later, you check in the Deluxe room of the Maui Coast Hotel in Kihei. The next few days are yours and yours only. Should you try one of the whirlpools and the hotel restaurant or stroll down to the beach first? Or drive to Ho‘okipa (Hawaiian for "hospitality") right away to check out the surfers? 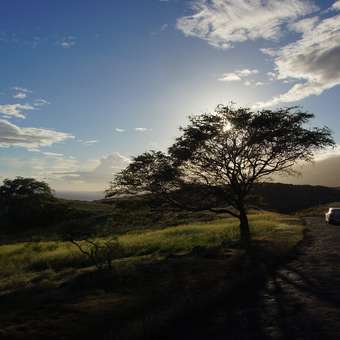 Further on to the famous „Road to Hana“, sunrise or sunset at the summit of the 3000m high Haleakala (the „House of the rising sun“), or a snorkeling trip to Molokini (the small crater off Maui’s shore)? Fancy playing a round of golf? Hang loose… you do not need a golfing licence here! During the afternoon of October the 19th, back to the airport and off to good old Kona! We will welcome you at the airport there with your stored luggage and help you check in for the long trip home. Please read the information relevant to Package 1 Maui – it is the same hotel there. You will leave Maui for Kauai (the Garden Island) on the 18th of October. Your car will await you at the airport in Lihue. Then off to your perfectly located accommodation, the Courtyard by Marriot. From there, excursion to the Hanalei Bay and further by foot in the Napali State Park are possible. Explore the Waimea River in a kayak and marvel at the eponymous Canyon. By now it is obvious why King Kong and Jurassic Park were filmed here – let’s take a helicopter and look for dinosaurs! On October the 22nd, back to Kona via Honolulu! We will welcome you there with your stored luggage and help you check in for the long trip home. Compose your individual island-hopping program, we will gladly assist you. Send us your requirements or call us! We have a large selection of possibilities.